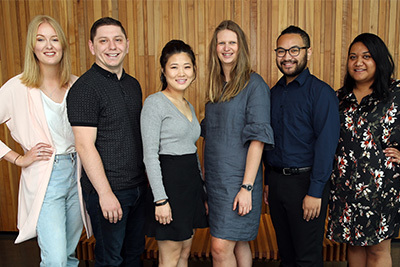 21 AUT graduates have been hand-picked by major companies including Lululemon, Enviropod, Paramount Recording Studios and Sundance Institute to be international interns in 2019. Te Puea Matoe who will graduate with a Bachelor of Arts majoring in Maori Development and Bachelor of Laws will work at the New Zealand Permanent Mission to the United Nations in New York next year. She said her dream is now becoming a reality, as it has been a life goal to work for the United Nations. “I’m extremely passionate about indigenous rights, so I’m looking forward to seeing how the Indigenous forum works, the way in which the United Nations deals with different legal issues that arise in different countries and seeing how everything works on a global platform,” she said. Te Puea and her fellow graduates were selected through AUT’s Internz programme, an on-campus recruitment service offered by the University. As well as placing students and graduates in a variety of paid roles in New Zealand, Internz provides opportunities for final year students to embark on paid internships overseas. With support from AUT for flights, insurance, visas and a stipend, this group of graduates get the chance to put their learning into action in a different market. Seven more employers are in the final stages of the recruitment process and are expected to offer internships to our graduating students, bringing the total number of students going to global internships next year to 28. AUT’s Director of Development, Ella Monahan, said the Internz staff are delighted to be sending another group of great graduates out into the world. "It’s been exciting taking our service to more employers around the world this year – giving AUT students in the final stages of their degree access to more work opportunities in more cities around the world and more employers access to AUT’s great graduates,” she said. International applications are open to students with New Zealand citizenship, who have studied full time with AUT and are in the final year of their degree. Hear from Eden Wairua-Orme, Joseph Burn, Te Puea Matoe and Eamonn Dobson about where they’re heading to and what they’re most excited about.